I am a self employed and I use this application daily to track my mileage. It has been very helpful every year during tax season. Give it a try! Excellent tool and very functional. Support is responsive too. 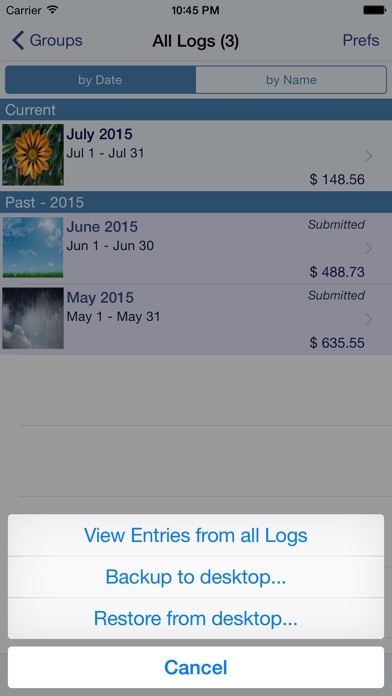 I have been using this app to record income and expenditures for my business for four years now. It's very easy to record entries, it retains client and merchant data for reuse, and it's very easy to duplicate entries for repeat business. It backs up to iCloud, for the Apple users in the house, and there are others backup options as well. And, at the end of the year, I can easily export a report, in multiple formats, for my tax preparer to use in completing my business taxes. I love this app, and highly recommend it! Best app ever for expense tracking! I have used a few and this one is by far the best. You could not ask for better customer support- the developer is very quick to respond and help with any questions. Highly recommend this app! I’ve used BizTracker for a few years now for my consulting business. It helps me stay current on my expense tracking and saves time at tax season! I like being able to capture pictures of my receipts and save them as compact PDF documents. It’s peace of mind that they also get backed up regularly. I recommend this to any small business owner challenged with tracking their expenses. It’s a time saver!! I use this to track all of my expenses when traveling. Then when it is time to do expense report I open the app and can see what expenses are for each day. Excellent expense tracker and 100% Customer Support services! Biz tracker has been a blessing for me to conduct all my financial needs for both my side job and my medical. It makes it very easy to print out statements for my tax lady to review. I will continue to use it as long as I’m still in business. I was looking for a way to manage our receipts after being DONE with Neat Receipts. Finally found this and Love it! I still use QB Desktop so I use this to have the receipt pictures and then via Dropbox I export CSV file to use Transaction Importer to bring into QB desktop. So happy with it and for less $$$ than apps that didn’t do half as much! LOVE BizXpense! Easy to log hours and export data for billing. This is one of the greatest apps I’ve bought for business.. Would buy it again, it’s Very easy to use.. I had a problem figuring out how to store emailed receipts. Scott helped me as we traded emails a couple times with explanations and instructions. I appreciated his attention and solution to my user education. Thanks Silverware! Been using it for three years without any issues. I love the functionally and the ease of use. I wish it had a desktop version I could synch with. I'd also like to have the capability to duplicate entire days without having to duplicate each leg. It's often that I travel the same routes during different days. I have found BizXpens to be very helpful keeping track of expenses and mileage. It was easy to adapt to. Makes managing our company a breeze! This app makes filling out expense report a a breeze! The developer is VERY responsive which gives me confidence to use this app. 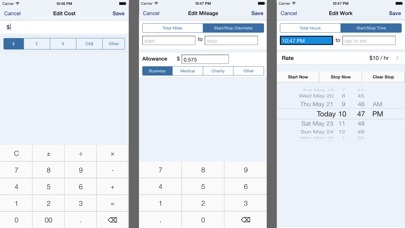 I have use this expense reporting app for a few years now and has worked fantastically well. It has all the features I need for my business. This is an excellent, comprehensive app with an intuitive, user-friendly interface. Highly recommended. Hyper responsive customer service by the developer, too. I use it for all my business and personal expense tracking. I do wish there was a website that came with it to see all my expenses. Excellent app - highly recommended. This is the best mileage tracker that I have used. I have daily routes for the farms that I have to work on, and this app allows me to set them up and easily record mileage between stops without having to turn on mileage tracking. Oh, and it's very quick to use, as well, and the customer support is fantastic. I just wish they had an android version for my phone. I use this app every day. While it could use some refinement, it still meets 95% of my business requirements... Definitely recommended to any small businesses users. Selected this app because it has everything I need in one place. This app is very customizable. I would definitely recommend purchasing the reports add on. I like the app it’s easy to use. Good app, could use some updates on the description field for expenses. Long descriptions are not as easy to edit. I've downloaded numerous (5 or 6?) expense tracker apps ....... This is the first app that has features I really like and found useful. The ability to edit task lists, etc. is key. Great app. I have used this app for all my handyman business records for several years. It was created for typical business expense recording and submission, but the deleloper has, on several occasions, created features I have asked for, including income (rather than original "submitted" category), which saved me having to create "negative dollar amount" expenses. I am able to create various forms for invoices and even estimates. I am very impressed with the development responses to some pretty specific requests. this app used to be very good at tracking my mileage. now it seems to quit tracking on its own accord (without me changing any wifi or gps setting nor closing the app) and I find myself constantly having to go in an manually enter in my mileage. On top of that, now it doesn’t even calculate the distance between addresses when I manually enter those in (as it used to do). I’m very disappointed in my annual subscription for services that are not properly functioning. This is an easy tool to use and it works great. I’m so glad I found it in the App Store and put it to good use. The only thing I would change is to allow the day to begin and breaks to be part of the day’s entry rather than a separate entry. Otherwise, it’s awesome! Detail-oriented application for those who need to manage more than a monthly shopping budget. Tracker app doesn’t work. Had it for 5 days and it only tracked me for 1. When I first got this I found a few problems with its adaptability, but I emailed their customer service and they not only got back to me, but made the changes I’d asked for in the next update! Was very impressed and will continue to use this product for my consulting company. This app has all the features I need, but the buttons are all awkwardly placed so the app is very difficult to use one handed, and entering an expense involves SO MANY taps. If the "save" button was moved to the bottom right and changed to a "next field" button this app would be 100% more pleasant to use. The milage tracker is a good idea, but still really buggy. If I'm at a particularly long stoplight or stuck in traffic, it creates multiple trips. It also only records about 70% of my drives. Continue to make my life easier!!! I reported last year that I had started using the app at the beginning of 2016, and it was working very good, but that I would report again by the end of the year. Well I have continued to use the app and I can say that is by far one of the most useful work tools that I have in my arsenal!! Use this daily to capture business mileage and expense. Have recommended it to several others. Easy to use. Unlike so many time tracker apps I am able to keep all of my data local as opposed to so many others that want to keep data--all valuable customer data on their servers instead. Fantastic!! I'm so grateful. This has been my go to app as a small business owner. It's fully customizable. Works beautifully for my small business. Great app- please don’t mess it up!!! 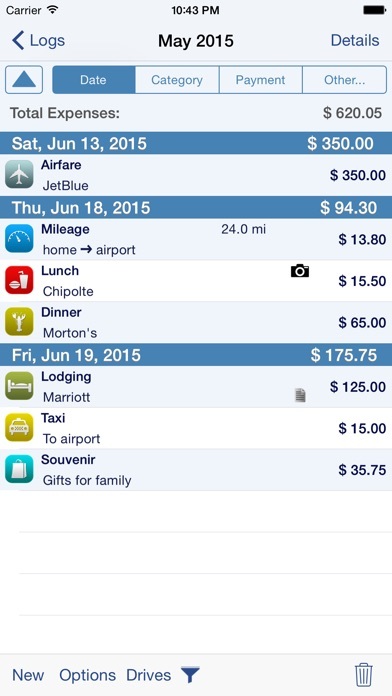 This is a great app that firmly tackles the mundane Time and Expense Report. Previous to this App, I was using Excel, but this is more portable and has quick and easy flow to create and send T&Es to multiple clients/employers. Couldn’t be happier with the product and the continual enhancements. I have used BizXpensTrkr for years and I absolutely love it! It’s simple to capture expenses, submit reports and get reimbursed. I have referred numerous colleagues. Thank you for creating this app. Not happy with the lack of syncing among devices and the fact that I had to pay extra for something that is not working. Simply does everything I want it to do. My accounting group approved and likes it as well. 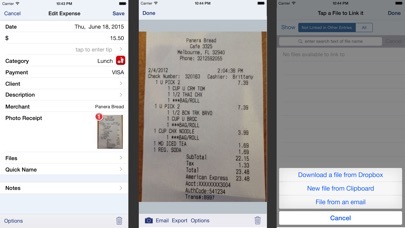 No more receipts scattered everywhere or lengthy sit down to prepare expense reports. 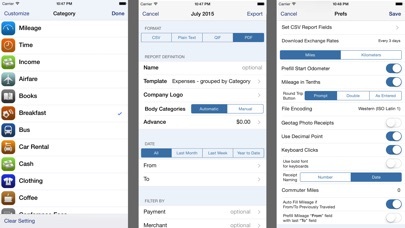 Simply create a report, take photos or download digital receipts to the app as they occur and presto. When it’s time to submit it’s just a couple of key strokes and it’s emailed to accounting. Tracks submitted and reimbursement as well and it’s all in one place. Easy to navigate and reliable!! It is perfect for individuals who are looking to manage their budgets or for small business owner looking to track expenses on the fly. This is a Hey easy to use app. I enjoyed it very much. The extension is a sham! I am not skilled at setting up new aps on my computer, however with Scott's assistance and patience I am now a functioning and happy user of this excellent program. I feel that the refinements that continue to be made have made it more valuable to me. I like this expense program. It walks you through the process of adding all the info for expenses. Does everything I need for tracking my expenses as a business consultant.